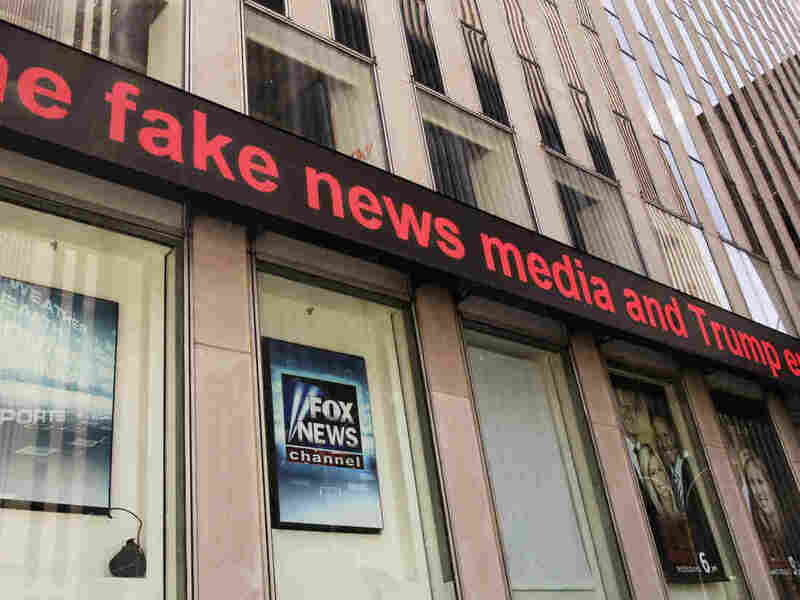 Journalist Sees 'Almost No Daylight' Between Fox News And White House Agendas Vanity Fair's Gabriel Sherman says the president and Fox News host Sean Hannity "speak almost daily, after Hannity's show, sometimes before, and sometimes for up to an hour a day." President Trump has the phone numbers of prominent Fox News personalities, says Vanity Fair's Gabriel Sherman. "He will call them to suggest story ideas or to compliment them, and when they go on the air, they are thinking of ways to speak directly to the president." President Trump's connections to Fox News got even stronger last week with his appointment of Bill Shine, a former network co-president, to serve as the White House's deputy chief of staff for communications. Gabriel Sherman, who covers the White House for Vanity Fair, notes that Shine has been named in "numerous lawsuits" related to the sexual harassment claims filed against the former Fox News CEO Roger Ailes. "To me, it's mind-boggling that someone with this amount of baggage, who is too toxic for an institution like Fox News ... would become one of the highest-ranking members of the federal government," Sherman says of Shine. Less surprising to Sherman is the overall influence that Fox News has on the Trump White House — and vice versa: "I saw this trend really started developing in the Obama years, as the right-wing media and the Republican Party started to fuse into this single entity." Fast-forward to 2018, Sherman notes, and "there's almost no daylight now between the agenda of the White House and the agenda of Fox News. ... In many ways, Donald Trump is the logical conclusion of entertainment and right-wing media taking over the Republican Party." One of the most disturbing [allegations] that comes to mind is a story that I reported in 2016 for New York Magazine about the case of former Fox News booker Laurie Luhn, who for years had a sexually and psychologically abusive relationship with Roger Ailes. And as Roger Ailes' deputy, it was Bill Shine's job to keep tabs on Laurie Luhn and prevent her from going public with these allegations that Ailes had abused her and blackmailed her into a sexual relationship. And I reported — and it was perhaps the most disturbing aspect of the story — ... that Bill Shine arranged for her to be committed to a psychiatric institution when she had a nervous breakdown, because Roger Ailes was worried about her going public. And Laurie Luhn alleged in our interviews that Bill Shine was also involved in monitoring her emails and her communications — again, very cult-like — to prevent her from speaking to outsiders. Bill Shine's first major assignment was to produce the rollout of Supreme Court nominee Brett Kavanaugh, and he brought in a new set of stage lights and positioned the lights differently to improve the president's look on camera. So part of his job will be messaging and the other part of his job will be stagecraft and production. People around the president say that his only way to survive the sexual harassment allegations [he faces] is to double down himself, to actually run toward the scandal, not away from it. And we're actually seeing that playing out in recent days with his unabashed support for Congressman Jim Jordan, who has been credibly accused of at least being aware of sexual abuse at Ohio State University and not doing anything to address it. And Donald Trump, I think, tweeted that he believes Jim Jordan 100 percent, he stands by him 100 percent. So bringing in people like Judge Roy Moore, Jim Jordan and now Bill Shine, who have all of this baggage around sexual harassment and abuse in their pasts, it sort of shows that Donald Trump is not giving any daylight. He's not going to give an inch on this issue, and it's sort thumbing his nose. ... It's a sort of a form of trolling of his critics to say, "Not only do I not care about these allegations, I'm going to surround myself with people who have the very same issues." In the wake of Ailes' departure from Fox News, there was a real power vacuum. I made the argument in a piece for Vanity Fair that Donald Trump really became the executive producer of Fox News. It's not only Sean Hannity that he speaks to. Donald Trump has, on his phone list, the numbers of many of the prominent Fox News personalities, and he will call them to suggest story ideas or to compliment them, and when they go on the air they are thinking of ways to speak directly to the president. So there is this really bizarre and surreal dynamic that the president of the United States is the executive producer, the head of one of the three cable news networks, which exists to promote his agenda. ... I think it's more than a feedback loop, I think it's basically one organization. They speak almost daily, after Hannity's show, sometimes before, and sometimes for up to an hour a day. Hannity has become a de facto chief adviser/strategist/chief of staff. I mean, he recommends ideas, policy ideas, communications ideas to the president, and just the other day, I was told by someone who had spoken with Hannity that Hannity has been telling the president that the moment that Robert Mueller issues his report to the Justice Department on the obstruction of justice case that ... he's supposed to deliver this summer prior to the midterm elections, that Hannity has been telling the president that that is the moment he needs to fire Robert Mueller and [Rod] Rosenstein, because he can then go to the public and say, "Oh well, this isn't obstruction. I waited till they delivered the report, and now this witch hunt needs to end." Amy Salit and Mooj Zadie produced and edited the audio of this interview. Bridget Bentz and Molly Seavy-Nesper adapted it for the Web. In this interview, Gabriel Sherman mistakenly refers to Rod Rosenstein as Ron Rosenstein.